This is perhaps the most aggressive teams have been in pushing top prospects to the Major Leagues in recent memory. In 2018, nine of MLB.com's Top 100 Prospects found themselves on Major League Opening Day rosters. This year -- when 28 of the game's 30 clubs will be playing their first games of the season on Thursday -- that number is up to 12, including three of the game's top four overall prospects. Two of the 2018 nine hadn't played in the Majors yet. One (Shohei Ohtani) had just been signed from Japan. The other (Scott Kingery) had signed a new contract to make it happen. This year's crop includes four who have yet to make their big league debuts, with Fernando Tatis Jr., Eloy Jiménez, Chris Paddack and Pete Alonso all getting the call for the first time. Of that quartet, only Jiménez signed a pre-arbitration contract, meaning the Padres and Mets were willing to put aside service-time clocks and potential free-agency worries to play their best players when they showed readiness. Whatever the circumstances that brought them to The Show, these are the dozen Top-100 prospects slated to open the 2019 season where every player dreams of playing -- the Major Leagues. No. 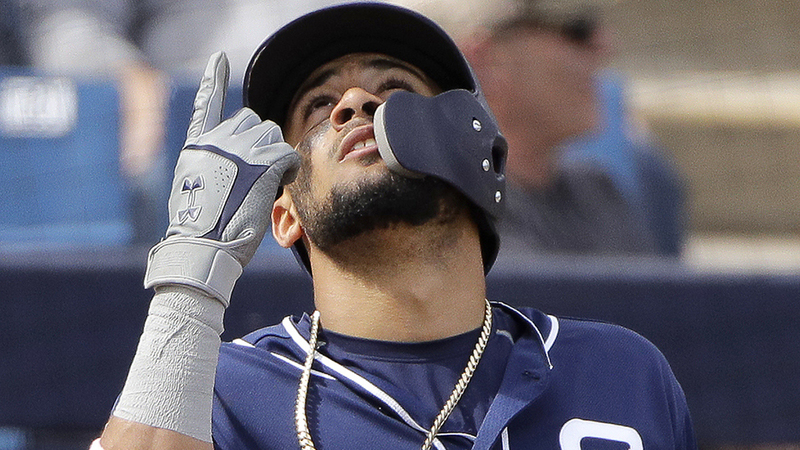 2, Fernando Tatis Jr., SS, Padres: What a breath of fresh air this is. When Manny Machado signed with the Padres in February, he talked about his willingness to move from shortstop to third base in deference to Tatis, adding "He's a beast. Have you seen him?" What San Diego fans will see up close soon is a 20-year-old with an all-around impressive bat, plus speed and impressive defensive skills for a shortstop who stands 6-foot-3. He hit .286/.355/.507 with 16 homers and 16 stolen bases in 88 Double-A games last season, and after a hot spring, the Padres have decided they've seen enough to skip him over the Pacific Coast League and start his service-time clock immediately. It should be the beginning of a beautiful partnership on the left side of the Petco Park infield, and when Luis Urias arrives at second base, supplanting Ian Kinsler, the entire San Diego dirt should be secured for a long time. What a concept. No. 3, Eloy Jiménez, OF, White Sox: For the game's top outfield prospect to get a spot on the Major League roster for Opening Day, it took him agreeing to a six-year, $43 million deal with two club options. The 22-year-old slugger had been optioned to Triple-A Charlotte earlier in the spring but was officially added back on Tuesday, two days before his debut in Kansas City. Jiménez has been one of the Minors' best bats over the last three seasons, routinely producing batting averages above .300 and OPSes above .900. In what should be his final Minor League season, he hit .337/.384/.577 with 22 homers in 108 games between Double-A Birmingham and Triple-A Charlotte, pushing his case for the Major Leagues. He'll open in left field for the South Siders, but the bat is always going to be the big draw -- Jiménez is capable of hitting for a good average and providing 30-plus homers in the Majors right away. If not for the eventual arrival of top overall prospect Vladimir Guerrero Jr., he'd be the favorite to win AL Rookie of the Year. No. 4 Victor Robles, OF, Nationals: No Bryce Harper? Fine, the Nationals will plug in arguably the toolsiest outfield prospect in the game instead. Robles has four tools that grade out at 60 or better on the 20-80 scouting scale. His run tool will be the best in the Majors when he becomes a full-timer. (During his 21-game look last season, his Sprint Speed ranked in the 95th percentile, according to Statcast.) The only thing that isn't plus yet for the 21-year-old is his power, and the Nats are hopeful he'll grow into some as he continues to develop his game at the same age as a college senior. Even if Robles can't add significant pop, he should provide stellar defense (both with the glove and the arm) in center alongside Adam Eaton and Juan Soto and have enough bat and speed to feature atop the Washington lineup for years to come. No. 26, Francisco Mejia, C, Padres: How much playing time Mejia will get remains up in the air. What isn't is his Major League status. The 23-year-old switch-hitter is expected to initially split duties behind the plate with Austin Hedges. He won the spot after batting .254/.380/.625 with three homers in 19 games this spring, demonstrating his strengths as a bat-first backstop. Mejia also possesses a plus-plus arm, but Hedges is the better all-around defender. The younger of the two also has some work in the corner outfield spots from his time in the Indians system, which could come in handy for him if the Padres decide they really like his bat but don't want to keep Hedges out of the starting nine. The important thing is, San Diego is giving Mejia a chance to seize the job while playing in the Majors rather than asking him to prove his readiness with more guaranteed playing time in El Paso. No. 30, Kyle Wright, RHP, Braves: Atlanta started the spring with at least one opening in its rotation, and that expanded to two when Mike Foltynewicz experienced elbow issues, forcing him on the injured list. Wright -- the club's No. 2 pitching prospect behind Mike Soroka -- seized the opportunity and is slated to get his first Major League start Sunday in Philadelphia. The 23-year-old right-hander showed off a plus fastball, above-average breaking pitches in his curve and slider and a good changeup during a Grapefruit League campaign that generated inconsistent results. Still, that package of pitches, along with an improved delivery, gave the Braves confidence that he was more worthy of this first look than options like Touki Toussaint, Kolby Allard and others. With so many more pitchers knocking on the door, Wright will have to prove himself quickly or else be temporarily sent either back to Triple-A Gwinnett or to the Atlanta bullpen, where he made four appearances last September. No. 33, Alex Reyes, RHP, Cardinals: With 50 career innings pitched in the Majors, Reyes will no longer be a prospect after he next records an out on the game's biggest stage. Unfortunately, he's in that position after missing all of 2017 season due to Tommy John surgery and most of 2018 with a right lat strain. Back to full health, he'll open the season out of the St. Louis bullpen, in part so the club can monitor his innings. There's no doubt his stuff will play in the Majors. His fastball has hit triple digits in the past, and his curveball is quite the weapon. Add in a slider and changeup that can flash plus, and it's a nice pitching arsenal. That could lead to a career as a dominant late-inning option. However, the hope here is that Reyes proves healthy long enough to get at least one more look in the St. Louis rotation by season's end. No. 34, Chris Paddack, RHP, Padres: This would have served as a shock before Spring Training. After a few weeks of watching Paddack dominate the Cactus League, perhaps it's less of a shock. As they're doing with Tatis, the Padres are skipping Paddack over Triple-A. And why not? He posted a 1.76 ERA with 24 strikeouts and three walks in 15 1/3 innings against big leaguers this spring, and the 23-year-old righty was also one of the most dominant pitchers in the Minor Leagues last season. His 35.3 percent strikeout rate and 2.4 percent walk rate each ranked second in the Minors among pitchers with at least 90 innings in 2018. His rate of 15.0 strikeouts per walks was tops among the same group. Paddack does an incredible job of hitting his spots with a plus fastball and a plus-plus changeup. If he can develop his curve into an average Major League offering, he'll be a feature in the Padres rotation for a long time. His debut comes Sunday against the Giants. No. 35, Alex Verdugo, OF, Dodgers: Verdugo opened both 2017 and 2018 with Triple-A Oklahoma City, and after 776 career at-bats in the Pacific Coast League, he'll begin 2019 in the bright lights of Los Angeles. He'll do so initially as the team's fourth outfielder behind Cody Bellinger, A.J. Pollock and Joc Pederson. He got looks at all three outfield spots this spring, though he primarily stuck with center and left. Verdugo's arm is a weapon anywhere, and his range is good enough to make center work. The left-handed-hitter has always shown a promising hit tool in the Minors (see his career .321 average in Triple-A). However, his power is average at best, and he's yet to stand out offensively in the Majors. This year, though, he'll get a longer look to prove he can carve out a role with the perennial NL contenders. No. 51, Pete Alonso, 1B, Mets: Another decision that technically came down to the wire but likely never needed to be that close. The Mets made promises all offseason and into spring to bring the best 25 players with them to Opening Day in Washington. Alonso looked like he belonged after leading the Minors with 36 homers between Double-A and Triple-A in 2018, and he solidified his case by hitting .352/.387/.620 with four homers in 22 games this spring. The 24-year-old first baseman won't offer much value with his glove, and because of that he could lose some time to the better fielder in Dominic Smith, who also cracked the Opening Day roster. But at season's start Alonso's bat will be where it belongs, where it can go against the best pitching baseball has to offer. No. 62, Josh James, RHP, Astros: Houston's No. 4 prospect entered the spring as a contender for the fifth spot in the rotation. Plans changed when he suffered a quad strain in February, though manager A.J. Hinch said at the time he could still be a bullpen candidate if everything worked out the rest of the way. Apparently, everything did. James will indeed open the year as a reliever, with Brad Peacock taking the starting spot. That doesn't mean James might not get a rotation look further into the season. The 26-year-old righty can pitch in the upper 90s with his fastball while mixing in an above-average slider and a plus changeup -- a package that helped him fan 36.3 percent of the Minor League batters he faced as a starter last season. It would have been interesting to see how a healthy James could have competed with Peacock, but every relief outing he has will be another audition for that starting spot and will increase in importance as Forrest Whitley continues to exhibit Major League readiness. No. 65, Danny Jansen, C, Blue Jays: At least one of the Blue Jays' Top-100 contingent is opening 2019 in the Majors. Jansen played 31 games for Toronto last season after getting called up on Aug. 12 and produced a .247/.347/.432 line with nine extra-base hits. That made the Jays comfortable enough to deal Russell Martin to the Dodgers, clearing room on the depth chart for their No. 3 prospect. The 23-year-old should open 2019 behind the plate, catching Marcus Stroman's first pitches of the season. Jansen has the chance to be an above-average hitter -- his 146 wRC+ was the highest by a Minor League catcher with at least 300 plate appearances in 2018 -- and at a time when the catching position features a dearth of good bats, he could be of even higher value to the Jays' rebuild efforts. No. 81, Bryse Wilson, RHP, Braves: Wilson pitched at four different levels in 2018, beginning at Class A Advanced Florida and ending in the Majors, and he remained at the highest level when the calendar flipped. The Braves have him slated to take the other open rotation spot next to Wright to open 2019. In fact, he'll actually pitch first, getting the ball for Game 2 on Saturday in Philly. The 21-year-old righty attacks hitters with a plus fastball and a solid slider and changeup. He fanned 143 batters over 125 2/3 innings in the Minors last season, despite facing so many new challenges. Although he didn't stand out in his three big league appearances (five earned runs allowed in seven innings), he steadied the ship with a 3.29 ERA, 1.02 WHIP, 13 K's and two walks in 13 2/3 innings this spring. Like Wright, he might need to come out of the gate firing to keep his spot, but the Braves wouldn't have given him this chance if they didn't think he was ready.